The pastor asked several members of his congregation to get up in front of church, spread their arms out wide and form a line facing us. Then he called a small girl from her seat and asked if she would place her hand out flat and squeeze it in somewhere near the middle of that human chain. The pastor then explained that the chain formed by the arms represented eternity and the little child’s hand represented our life. Pointing to the chain on one side of the child’s hand, he said that this end represented the life that went on forever, before we were born, and the chain on the other side of her hand, represented life that goes on forever after we die. That was an eye-opener me. You mean there was all that before my life and, there’ll be a whole lot after it – here on this earth and forever after? If you’re anything like me, you may be a bit you may be a bit self-centered and feel like your life is the end all. Before we were, there wasn’t a whole lot going on and after we go, well, things will be about over. But the chain was a great wake up call for me. It showed me, in the concept of time itself, how small my lifespan really is. 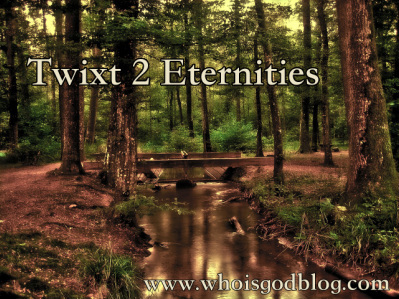 “We live in a small gleam of time twixt two eternities,” our pastor said. And he went on to explain that the Bible calls our lifespan a mere “handbreadth” of time. If you look up “handbreadth,” you’ll find that it means a measurement of four fingers that is equal to nearly four inches. In other words -- in the grand scheme of things, life is pretty short! I don’t know why I’m like that, really. Maybe because time is something I can’t control. But looking at it from our pastor’s perspective, I’ve come to realize that since life is pretty short, I want to make the most of the time I have left. And I liked what our pastor did next. Having index cards and pencils passed out to the congregation, he told us that most likely the oldest we would live was 90 barring an earlier death. And with that in mind, he told us to subtract our age from 90 to find out how many years we might have left. I had 43, which looked pretty short compared to the girl next to me who had written 84 on her card! From there, the pastor had us flip our cards over and write three things we would like to accomplish in our lives before we died. And he told us to quietly seek God for his will in this. Both exercises got me really thinking about my life and it made me want to try harder to make every moment count. It would be tough to do this on our own though wouldn’t it? Oh, we’d be mindful about it for a little while, but soon the stuff of life would take over. I think the solution, as the pastor later said, is to keep God in the center of every moment of our lives. That way we can look to him to lead and guide our steps to make the most of the time we have left. That should help me stay on track. How many years till you turn 90 and what are you going to do with them?